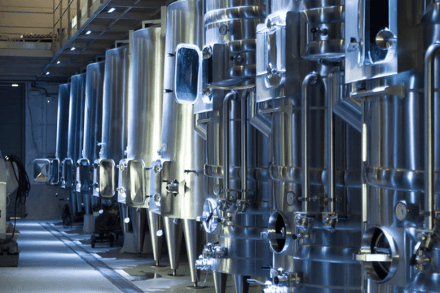 Ken Putnam, Director of Cellar Operations at a winery in California, was using non-Gamajet rotary impingement machines to clean the interiors of large wine storage and fermentation tanks. The largest tanks at the winery range in capacity from 65,000-650,000 gallons and can be up to 43’ in diameter. Cleaning requires removal of tartrate buildup, wine concentrate, and polyphenolic residue. Lack of value, affordability, and performance were the main issues Ken was experiencing with the inferior rotary impingement machines. Fed up with constant maintenance and time-consuming rewashes of approximately 200 tanks, he decided to purchase an Alfa Laval Gamajet machine. An Alfa Laval GJ 8 was specifically configured for the application, with proper pressures and flow for maximum cleaning performance. After operating wash cycles with his new Alfa Laval Gamajet device, Ken noticed an exceedingly better performance in the same amount of time it was taking him to clean his tanks with the previous cleaning method. He reported improved removal of tartrates, less occurrences of re-cleaning, less water usage, less time spent cleaning, and fewer breakdowns resulting in less maintenance expenses.